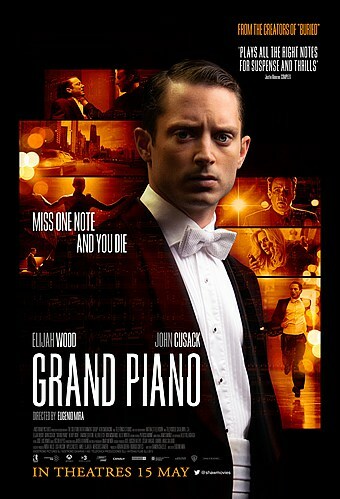 Elijah Wood trades in his fuzzy feet for dextrous fingers to play pianist Tom Selznick in this suspense thriller. Selznick, a prodigious young talent who crashed and burned after failing to complete an “unplayable” piece five years ago, reluctantly puts on a comeback performance at the behest of his wife, actress Emma (Bishé). Everything is in place, especially the customised Bösendorfer grand piano that belonged to Selznick’s late mentor. In the middle of his performance, Selznick finds a threatening message in the sheet music, and is warned by his would-be killer Clem (Cusack) that one wrong note will result in a bullet through the head. All eyes are on the pianist as he gives the most important performance of his career – and tries to keep it from being his last. From the opening titles, in which the inner workings of the titular instrument are shot as if they were components of a trap from the Saw movies, audiences will know what they’re in for. Grand Piano is a pulpy thriller that is earnestly Hitchcockian, with composer Victor Reyes channelling Bernard Herrmann in his soundtrack. Produced by Rodrigo Cortés, it bears a similar ominously theatrical feel to Red Lights, which he directed. That aesthetic is certainly more overt here, the colour palette predominantly blood-red. While it is a look that draws one in, there’s also a degree of artifice exacerbated by the rather out-there premise. Wood has picked some quirky films over the last few years and his refusal to be pigeonholed after starring in a successful blockbuster franchise is admirable. He makes for an adequately convincing master pianist, his perpetual youthfulness upping the “child prodigy fallen from grace” quotient. Working with coach and hand double Héctor Eliel Márquez, Wood does actually look like he’s playing, and does actually look like he’s good. We wish that the trailer (and the poster) didn’t give away that John Cusack was the villain, as it would’ve been a nice surprise reveal. He spends most of the film off-screen, present only in the form of a menacing voice in Selznick’s ear. While this is yet another case in which the revelation of the antagonist’s motive is at least a bit of a let-down, Cusack is still solid opposition to our heroic pianist. Shout-out to Alex Winter of Bill And Ted fame, who shows up as a suspicious theatre usher. Excellent, dude! Grand Piano is an entertaining affair that isn’t afraid to dip into silliness and, thanks to some assured direction, isn’t overcome by its preposterous premise, instead gamely running with it. While far from wholly satisfying, it’s a slickly-crafted, well-acted suspense thriller packed with pizzazz and flourish, Lang Lang-style.